WHAT MAKES NAUTICRAFT PEDAL BOATS DIFFERENT? We are often asked what makes our boats special and different from other pedal boats out on the market. Though we feel inclined to think it is enough that they have a way of evoking a deep love for them by their owners – including being enamored by their sleek design – realistically there are some specific answers to this question. One of the most important things that Nauticraft pedal boats have over others on the market is operating function. Their carefully crafted designs focus on enabling them to move through the water smoothly and efficiently, and this functional efficiency carries over into their aesthetic shapes, as their forms present an eye catching and welcoming view. Although pedal boats don’t necessarily attain a high speed (compared to a powered boat), Nauticraft boats give the operator a pleasing sense of performance relative to input effort. Nauticraft boats are propelled through the water by large, relatively slow turning propellers (two propellers on both the Encore and Sprite models). Over the years it has been repeatedly test proven that a propeller drive is still the most effective means of moving a pedal boat. The Nauticraft propeller was specially designed to push our boats at an effective pace that ordinary humans (non-olympic type athletes) are able to comfortably maintain over an extended period of time. Further, the completely submerged propeller pushes the boat quietly through the water, not disturbing or upsetting underwater marine animal/fish life, and also is comforting to the boat’s occupants. Boxy commodity market (inexpensive) paddle boats are usually driven by paddle wheels and have the advantage of simplicity, but the noisy splashing they make when throwing water in unwanted directions is not at all efficient. Almost everyone has had the unsatisfying experience of peddling one of these boats at one time or another. With Nauticraft boats, the high freeboard enables you to feel comfortable in hopping in and going with just street clothes on. Canoes and kayaks have their appeal, as they are generally inexpensive and easy to use, but with some of them their low sides can let errant waves wash in over the side. The paddle operation of canoes and kayaks requires the use of hands/arms, as opposed to the stronger leg muscles used on pedal type craft. Also, the paddle requirement of arms/hands precludes their other uses, such as handling field glasses, eating/drinking, waving to other boats/shore people, etc. Another feature of Nauticraft’s Sprite and Encore boats is that two (pedaling) people sit next to each other in a companionable side-by-side position. 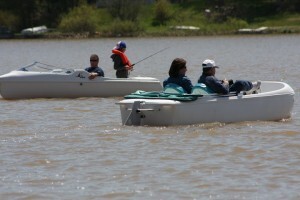 When canoes/kayaks are multi-seated it is in tandem – one behind the other – in a less personally comfortable mode. 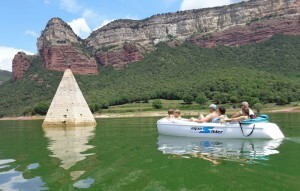 Nauticraft boats are rotationally molded of plastic polyethylene material (as are many canoes and kayaks). Polyethylene is a material of “soft stiffness”, and the production process of rotational molding naturally gives outer edges and corners of the molded part a thicker material cross section. This added thickness gives additional impact resistance when a boat inevitably comes into contact with the elements. And, as rotational molding material has its color integrated throughout, scratches and scrapes show less than other boat materials. Nauticraft boat seats are ergonomically designed to contour fit the human body in a recumbent style, giving both seat and back support. As individual seats they are rotationally molded of the same plastic material as is used for the boats. A 1 ½ inch thick layer of cushioning foam is adhered to the seat facing, followed by a cover of weather resistant marine vinyl, all of which combines to give comfortable full body support. To give the proper pedaling position the seats have a fore-aft travel adjustment of 12-13 inches (in one inch increments), which will accommodate most adults and older children. Nauticraft boats are controlled with large steering handles which fall readily to hand. Rather than cables these handles operate push-pull rods to control a large spade type rudder (two rudders in the pedal Encore). With the rudders located in the slipstream of the driving force of the propeller this system gives quick and immediate steering. There are many different choices of boats out on the market, and each has its own appeal, but here at Nauticraft we love the boats we build and use ourselves. The testimonials we get from our customers – that we call our Nauticraft family – indicate that owners (virtually around the world) love and enjoy them too. This gives us great satisfaction in performing the jobs we do – to make our boats the best boats we can.